The Bobcats celebrate a three-game sweep against Trinity in early May 2015. The 2016 regular season campaign begins at home on April 2 vs. Tufts and concludes on April 30 with a DH at Colby. The 2015 Bobcats had a roller coaster of a season, but played their best baseball when it mattered the most to reach the NESCAC Championship Tournament for the second straight year. The season began with a great trip to California, where we went 4-2 and swung the bats extremely well, averaging almost nine runs a game over the week. Once we returned home, we were met with the worst winter in my time here at Bates, and we were only able to play three games the entire month of March. As the snow melted and we turned to April, we were met with the bulk of our schedule where we played 20 games. Our performance was up and down over the month, but we put ourselves in a situation where we controlled our own destiny and could make the NESCAC tournament with a three-game sweep over Trinity in the final weekend of the season. In what was one of the most memorable weekends in my time here, we took all three games in dramatic fashion and clinched the tournament. Throughout the year we were lead offensively by seniors Nate Pajka and Sam Berry. They combined for 15 home runs and drove in 62 runs. Both earned All-NESCAC honors, and Pajka was named to the All-Region Team as well. In addition to these accolades, they were voted Co-MVP by their teammates. Our “Unsung” Hero award winner was Alex Parker, who was a catalyst on our team over his four-year career and especially valuable in his senior season. Alex was the ultimate competitor and is one of the best defensive players I have ever coached. He earned a starting spot at 2B as the season moved along and helped us to win some huge games down the stretch. On the mound, we were lead by Connor Colombo who developed into our Ace. He went 4-0 in the conference and gave us some huge innings throughout the year. He also was voted as our team’s top pitcher by his teammates for all that he accomplished during the season. In all, we graduated 10 seniors who were a part of two NESCAC tournament teams and compiled 79 wins over their career. While it will difficult to replace them individually, they did a great job of leading by example and have made our program and the players in it better. During the fall 2015 the Bates Baseball team partnered with Montello Elementary School in Lewiston. Each week, every member of the baseball team volunteered their time and worked the students at Montello. Bates players assisted with recess duty, organized team games and activities during free periods, and were able to help with physical education classes. In all, the team volunteered more than 100 hours and worked with almost every student at the school. This spring, Bates Baseball has teamed up with the Vs. Cancer Foundation to battle children’s cancer. We have set up a website where you can help us with our goal to raise money to fight against cancer. On May 6, our home DH vs. Williams will be designated as a Bates Vs. Cancer game, and we’ll be promoting this great cause in a number of ways. 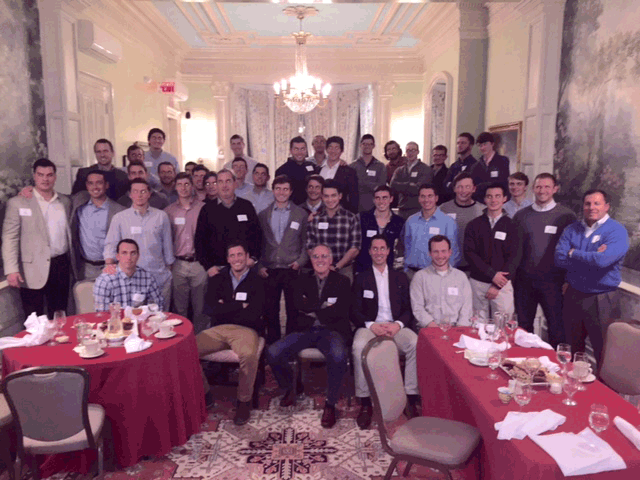 Again this fall, we hosted our Baseball Networking Event in Boston that was a huge success. More than 20 alumni from the ’70s up through our most recent grads attended, along with our current team members. The goal of the event is for our current and former players to connect over dinner to discuss careers, transitioning to life after college, and how being a Bates baseball player prepares you for a career. The event grows each year, and it is my hope that those of you that could not attend this year will join us in 2016. Look for an email from me in late summer 2016 with details about the next Baseball Networking Event. More than 20 alumni from the ’70s through 2015 joined current team members at the fall 2015 Networking Night event in Boston. In fall 2014 we completed a significant upgrade to our facilities with the addition of the Hitting Building. This past fall we enhanced the hitting building by adding insulation, walls, and electric heaters. Huge thanks go out to Bruce and Karen Czopek P’16 for all of the resources that they have dedicated over the last couple of years to make this building happen. Bruce served as the “foreman” and managed all of the construction this fall when our players installed the insulation and walls on the inside of the building. This was no easy task given the team’s skills (or lack thereof) that he had to work with. The Bates Baseball program is forever grateful for all of Bruce and Karen’s time and financial support that has provided us with such a great facility. To see how it all came together, check out this time-lapse video of the construction project. Leahey Field has grown into one of the premier facilities in Division III and the NESCAC. Since 2010, we have been able to add permanent fencing, a scoreboard, a new home bullpen, dugout fencing, and a flagpole in right center in addition to the hitting building. Moving forward, it’s my goal to turf our infield, upgrade our backstop, add seating behind home plate as well as a press box. This year’s team will have a very different identify from the 2014 and 2015 teams, but I believe that we have the right guys to take us to our first-ever NESCAC Championship. With the graduation of some of our best all-time hitters in Griff Tewksbury ’14, Kevin Davis ’15, Nate Pajka ’15, Sam Berry ’15, Rockwell Jackson ’15, and Mekae Hyde ’15, we are going to rely heavily on our veteran pitching staff. Seniors Connor Colombo, Chris Ward, Mark Cunningham, and Rob DiFranco will provide us with a legitimate No. 1 starter and three elite bullpen pitchers. Sophomore Connor Speed returns as our No. 2 starter, which gives us two returning NESCAC starters. The No. 3 starter is up for grabs, and a number of players will compete to earn that spot. 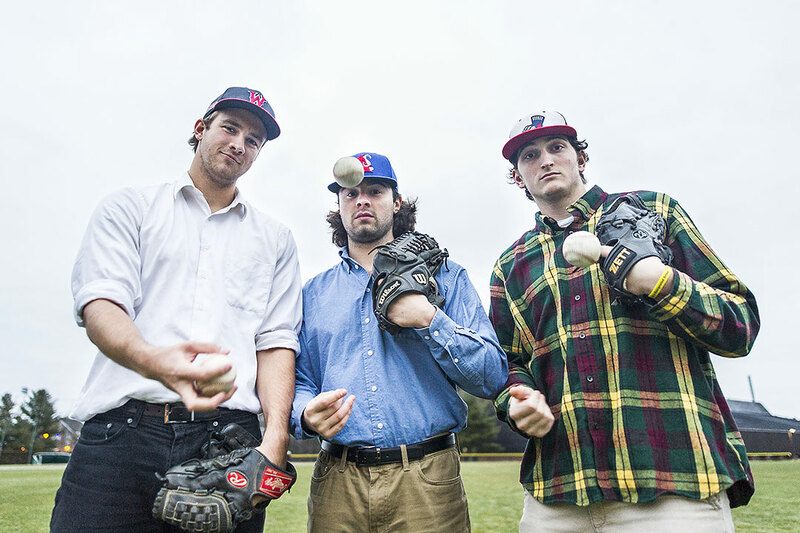 The 2016 Bobcat pitching roster includes veteran seniors Chris Ward, Rob DiFranco, and Connor Colombo. Offensively, we return two-thirds of our starting OF with Ryan McCarthy ’17 and Sam Warren ’16. Both will hit towards the top of our lineup and give us one of the best defensive outfields in the conference. In the infield Conor Reenstierna ’16 and Brendan Fox ’17 return and will man the left side of the field at 3B and SS. The remaining positions are wide open, with a number of really athletic guys hoping to earn starting spots. Our season begins with five games in Southern California, where we will take on Pomona–Pitzer, Whittier, and Lewis and Clark. After that we return home for a week until our next games in Winter Haven, Fla., against UMass Boston and Babson as part of the RussMatt Central Florida Invitational. Our New England non-conference schedule features match ups with some of the top teams in the region, including Southern Maine, St. Joseph’s, Husson, Salem State, Endicott, and NESCAC West rival Williams. We open up at home on April 2 vs. Tufts and conclude our NESCAC schedule on April 30 with a DH at Colby. In all, we will play 36 games (the new NESCAC max allowed) and hope to advance to the NESCAC tournament in Nashua, N.H., at Hollman Stadium on May 13, 14, and 15. With the addition of a second plane trip this year to Florida, we are looking for continued financial support from our alumni in order to make this happen. This year, our two trips will cost more than $50,000 above what our operating budget allows. All donations made to Baseball through Friends of Bates Athletics will go directly to these trips. Our alumni, parents, and friends of the program have been so generous over the years, and that’s allowed us to grow as a program and provide an elite experience for our athletes. If you have not made a gift to support Bates Baseball, please consider doing so. 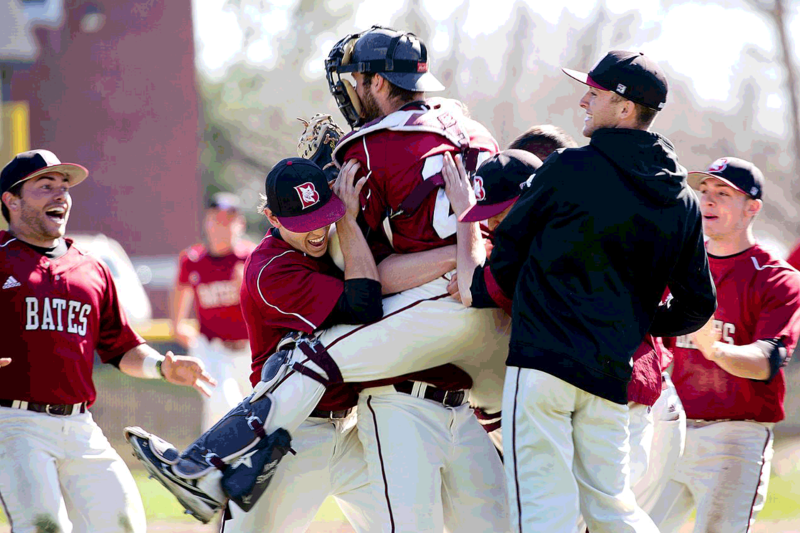 Just choose “Friends of Bates Athletics” on the online giving form and mention “Baseball” in the comments box to designate your gift to the team. 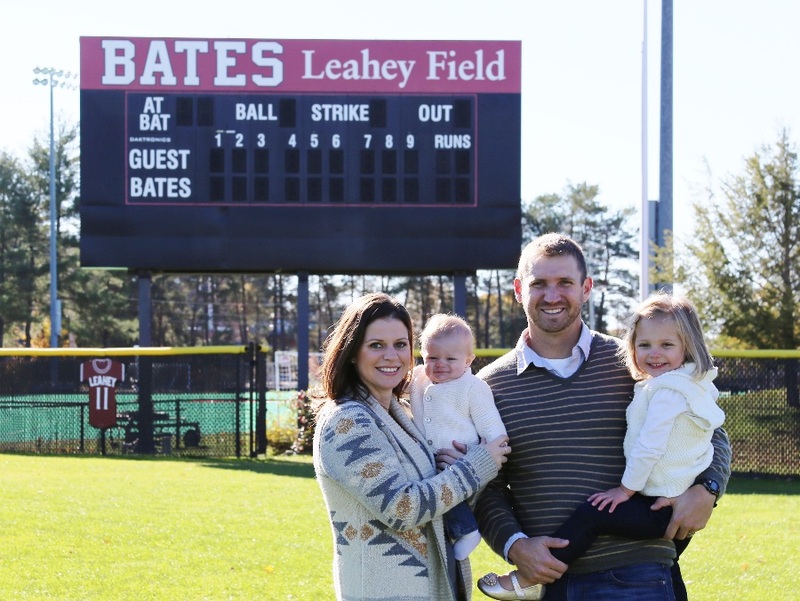 On behalf of Meaghan, Adelynn, and Grady, I want to say thank you for all your support of Bates and Bates baseball. Go Bobcats!